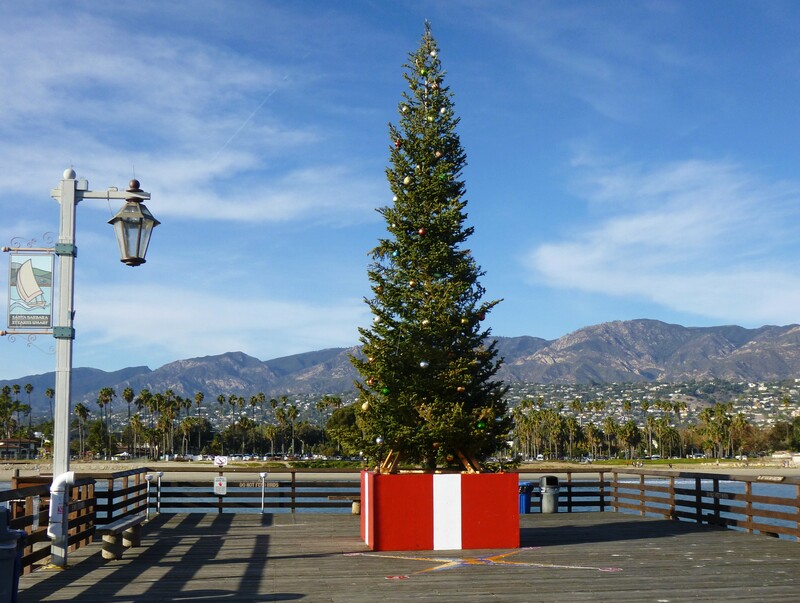 Join us on Stearns Wharf, December 9th to kick off the holiday season! Before the start of the Parade of Lights boat parade, Santa Barbara Mayor Cathy Murillo will switch on the lights of a beautiful 25-foot Green White Fir on Stearns Wharf to officially open the holiday season for the waterfront. The 32nd Annual Parade of Lights starts at 5:30 p.m. with some 30 boats motoring, sailing, and paddling the Santa Barbara Coastline. Judging for the parade takes place from the east side of Stearns Wharf. Take advantage of the opportunity to start your holiday season by having dinner, a treat, or do some holiday shopping for your family and friends. Gift Certificates are available at Wharf businesses. Parking is available on Stearns Wharf (if parked prior to 3:30 p.m.) as well as at the Chase Palm Park & Garden Street parking lots. The first 90-minutes of parking on the wharf is free! Sponsored by the Stearns Wharf Merchants. For more information, visit StearnsWharf.org. Stearns Wharf is located adjacent to the harbor in Santa Barbara, California, United States. When completed in 1872, it became the longest deep-water Wharf between San Pedro and San Francisco. Named for its builder, local lumberman John P. Stearns, the wharf served the passenger and freight shipping needs of California’s South Coast for over a century. Stearns Wharf celebrates Independence Day with the best view of the annual fireworks show. Read More…. to find what you are looking for or the menus. If you see this message, you have encountered a redirect to this page from somewhere that does not exist. Please utilize the search function to find what you are looking for or the menus. Have a Great Day! Santa Barbara's number 1 tourist spot Stearns Wharf has fun recreation, great restaurants, and amazing creatures at the Sea Center. Live music begins at 11:00 AM Fireworks show begins at 9 p.m.
After dark, watch the annual pyrotechnic display from one of the best locations in the city as fireworks shoot out over the harbor. Co-sponsored by the City of Santa Barbara. Stearns Wharf is located in the harbor in Santa Barbara, California. When completed in 1872, it became the longest deep-water Wharf between San Pedro and San Francisco. Named for its builder, local lumberman John P. Stearns, the wharf served the passenger and freight shipping needs of California’s South Coast for over a century. Stearns Wharf, Your local destination – and where State Street Meets the Sea. Ninety minutes free parking, and always dog-on-a-leash friendly. all who want to enjoy high-energy live music. can count on for a good time to be had by all. Santa Barbara Youth Music Academy is a non-profit music school started in 2009 to inspire and nurture the next generation of musicians. Executive Directors William Fiedtkou and Barbara Moseley and amazing staff coupled with their beautiful new location provides a one of a kind learning environment. Notes for Notes® is a 501(c)3 non-profit organization that designs, equips, and staffs after-school recording studios inside Boys & Girls Clubs offering youth the opportunity to explore, create, and record music for FREE. Notes for Notes Studios are packed with professional instruments – guitars, basses, drums, keyboards/synths – and equipment – DJ gear, digital music workstations – and full recording facilities. Beyond providing access to equipment and resources, we educate youth about careers both on the stage and behind the scenes. Notes for Notes was founded on the core belief that music is the universal language of humankind, with the power to transcend virtually any cultural, racial, or socioeconomic barrier. At the heart of the organization is a dedication to the relationships formed through music. Music inspires connection and collaboration, and it is through these relationships that we can make the most impact. For more information, please visit notesfornotes.org. giving their audience a contemporary and refreshing approach to classic jazz standards. David Rojas to record the classic, “Autumn Leaves,” at the Notes For Notes® studios.